Earthbath Ear Wipes are a fast, convenient way to keep your pet's ears free of wax and discharge which can cause infections and odor. Our wipes contain witch hazel, a natural cleanser and astringent, plus a sumptuous mix of nature's finest plant extracts with gentle therapeutic and deodorizing properties. Safe for all dogs, cats and other furry pets over 6 weeks old. Naturally fragrance-free. 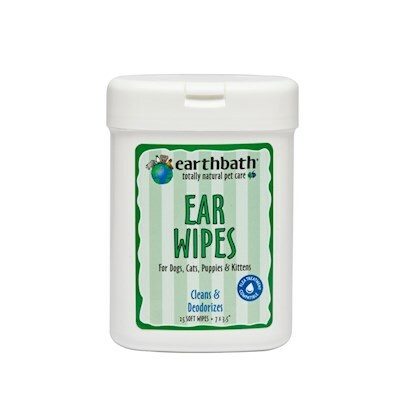 Earthbath Ear Wipes do not contain nything that would harm you, your pet, or the planet. This product contains no: parabens, phosphates, pthalates, DEA, synthetic dyes or perfumes. Any residue left behind is completely safe and will not harm your pet. Purified water, witch hazel, chamomilla recutita, cucumber extract, althaea officinalis root extract, citric acid, polysorbate, phenchem (natural preservative).